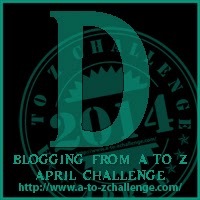 Last A to Z I did D is for Diary. I did not want to repeat this entry. Today I have chosen to do ‘D is for… Dream Journal”. When I was younger I always used to be fascinated with dreams. In adulthood, this fascination has waned, but I still keep a notebook beside my bed for moments when I can’t sleep or have inspiration in my dreams: but I don’t like to dwell on the bad things. This inspiration for this blog post came from The Bedside Dream Journal (Chronicle Books) which I have recently seen in a lot of local book stores. The journal entry has space for a dream description, themes/symbols and interpretative notes. It also includes a dream glossary. Similar options which guide your journal entries include the Fortune Telling Book of Dreams (similar to one of the Birthday Books from my B post) and the Knock Knock Dream Journal. But what if you are like me and want a dream journal / bedside book with less emphasis on dreams and interpretation and more emphasis on inspiration and self-discovery. I actually favour Knock Knock’s I Can’t Sleep Journal which simply prompts ‘ why can’t I sleep tonight’. Leaving you to write about your dreams, hopes, inspiration and loves when you wake up.I love this notebook. A similar option is Can’t Sleep Write Now another Chronicle Books Notebook with quick prompts for writers. Of course you could simply stick to the basics and use any old notebook. I am not stopping you. Do you write at night-time? If so, what do you use? Found you through the A-Z challenge. I have never kept a dream journal or written at night but I am sure it would make for some interesting reading as I can have some pretty weird dreams sometimes. Thanks for dropping by. Yes, I think most people wouldfill up a lot of pages with weird and entertaining dreams. I go the “any old” route. I recorded dreams more often a few years ago. I’ve had several that are quite memorable and significant, but most are just…the weird garden-variety stuff. I should do the bedside journal for the inspirations though. I get those sometimes at 3-4 a.m. and repeat the idea over and over to “remember” in the morning but usually don’t. remember that is. Great idea and reminder to get that going again! I write long handed too for my writing, it is just more inspiring (but I seem to double the time it takes for me to get anything done).